At a visit to Israel's Aerospace Industries, PM Netanyahu and Defense Minister Ya'alon address the threat Iran poses to Israel. Prime Minister Binyamin Netanyahu and Defense Minister Moshe Ya'alon toured the Israel Aerospace Industries' Systems Missile and Space Group in Yehud Monday to mark Israeli Space Week. Some of the world's most advanced observation satellites are produced at the site. Both Netanyahu and Ya'alon addressed the Iranian nuclear threat during the tour and the importance of preventing nuclear weapon capability that endangers Israel and the rest of the world. "This visit to the Aerospace Industries allows us to glorify the defense industry. 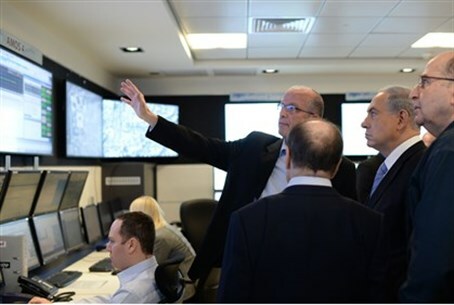 This site enables us to be one of the few countries in the world that have satellites in space, both for security and civilian purposes," Ya'alon noted. However, the Defense Minister continued, we also face threats and the instability created in the region by Iran. "We need to prevent Iran from achieving nuclear weapons capability. We need to prevent Iran from being able to attack us, whether it's from Hezbollah in Lebanon, from Hamas and Islamic Jihad in Gaza, or as we saw last Sunday, the start of an Iranian arm in the Golan Heights." Ya'alon stressed that it was not just Israel that needed to address the Iranian threat but also "Afghanistan, Iraq, Yemen, and elsewhere...making the space program all the more important to deal with these distant challenges." Netanyahu too made note of Israel's accomplishments in the aerospace industry and of the threat Iran posed to the country. "We are here in the framework of Space Week, which takes place close to the date of the death of the late Ilan Ramon. Israel is a space power. We operate on sea, on land, in the air and also in space in order to ensure Israel's security." "We are challenged from many directions, in many fields, but there is no doubt that the greatest challenge to our security is the attempt by Iran to arm itself with nuclear weapons," Netanyahu continued. "In this regard, the agreement now being formulated between the major powers and Iran is unacceptable to Israel. This agreement is dangerous to Israel, to the region and to the world. It leaves Iran the ability to produce the necessary material for a nuclear bomb within a few months and afterwards, to produce dozens of nuclear bombs. Therefore, Israel adamantly opposes this agreement," Netanyahu stressed. "I, as Prime Minister, stand up and say this unequivocally. We will do everything in order to prevent the arming of Iran with nuclear weapons capabilities."